Lance Armstrong To Pay U.S. Government $5 Million To Settle Fraud Claims : The Two-Way Authorities said the disgraced cyclist had defrauded his sponsor, the U.S. Postal Service, out of millions. He faced $100 million in possible penalties — but this settlement averts his looming trial. 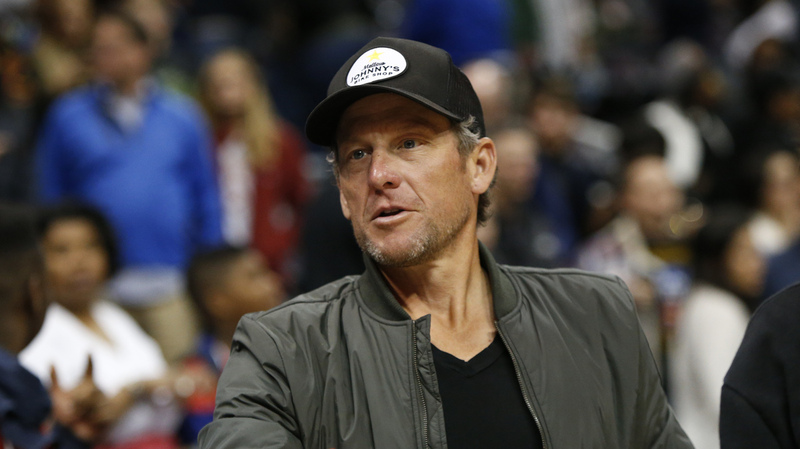 Lance Armstrong attends a 2017 NBA game in Atlanta. Lance Armstrong has agreed to pay the federal government $5 million to settle fraud allegations that could have resulted in a nearly $100 million penalty. The U.S. Postal Service, which had sponsored the disgraced cyclist's team, argued that Armstrong defrauded taxpayers by accepting millions from the government agency while using performance-enhancing drugs during competition. "A competitor who intentionally uses illegal PEDs not only deceives fellow competitors and fans, but also sponsors, who help make sporting competitions possible," Chad Reader, acting attorney general for the Justice Department's civil division, said in a statement. "This settlement demonstrates that those who cheat the government will be held accountable." Armstrong, for his part, cast the agreement as a win, as well. "I am glad to resolve this case and move forward with my life," the 46-year-old former professional cyclist said in a statement released to NPR by his attorneys Thursday. "I'm looking forward to devoting myself to the many great things in my life – my five kids, my wife, my podcast, several exciting writing and film projects, my work as a cancer survivor, and my passion for sports and competition," he added. "There is a lot to look forward to." During his time cycling, Armstrong famously won a record seven consecutive Tour de France titles after recovering from testicular cancer, six of which he won as a member of the USPS-sponsored team. But he was dogged by suspicions of doping throughout his career — including from his former teammate, Floyd Landis, who sued him in 2010 under the False Claims Act. As Reuters explains, the federal law "lets whistle-blowers pursue fraud cases on behalf of the government, and obtain rewards if successful." By 2012, the U.S. Anti-Doping Agency found that Armstrong's team "ran the most sophisticated, professionalized and successful doping program that sport has ever seen" — but it was not until 2013 that he publicly admitted to cheating in a highly publicized interview with Oprah Winfrey. Ultimately, Armstrong was stripped of his Tour de France wins and banned for life from competition. Not long after the Oprah interview, federal prosecutors joined Landis' suit on behalf of the USPS. The plaintiffs accused Armstrong of financially benefiting from his repeated false statements and, in turn, harming the government agency that spent tens of millions sponsoring his team. With Thursday's settlement, however, the trial scheduled for May 7 ends before it could even get underway. "The Postal Service has strongly supported the Department of Justice's intervention and pursuit of this case, as it always has been our position that Lance Armstrong misled the Postal Service," Thomas J. Marshall, USPS general counsel, said in a statement Thursday. "This matter has now been resolved in a manner that imposes consequences for that wrongful action," he added. "With this case, as in all other instances, the Postal Service vigorously defends our brand and our position as a trusted government institution." Landis, who has previously admitted to doping himself, will receive about $1.1 million as part of the settlement. "I am particularly glad to have made peace with the Postal Service," Armstrong said Thursday, noting that he has tried "to take full responsibility for my mistakes, and make amends wherever possible." "I rode my heart out for the Postal cycling team, and was always especially proud to wear the red, white and blue eagle on my chest when competing in the Tour de France," he added. "Those memories are very real and mean a lot to me." A previous version of this story mistakenly stated that fraud allegations against Lance Armstrong could have resulted in a nearly $100 penalty, rather than a $100 million penalty.